We went back to my ortho doc this past week and the bad news is that I’ll be wearing this cast on my right wrist till the first week in January. The good news is that I’ll only be wearing this cast on my right wrist till the first week in January! I’m getting used to maneuvering through my days one-handed, and I’m planning my future quilting/sewing/knitting/crocheting/beekeeping/homemaking projects since I can see the light at the end of the tunnel. In the meantime, it takes me 2x longer to do the things I CAN do, but I slog through them. I am so glad that I had my soap-making marathon just before I fell and broke my wrist. 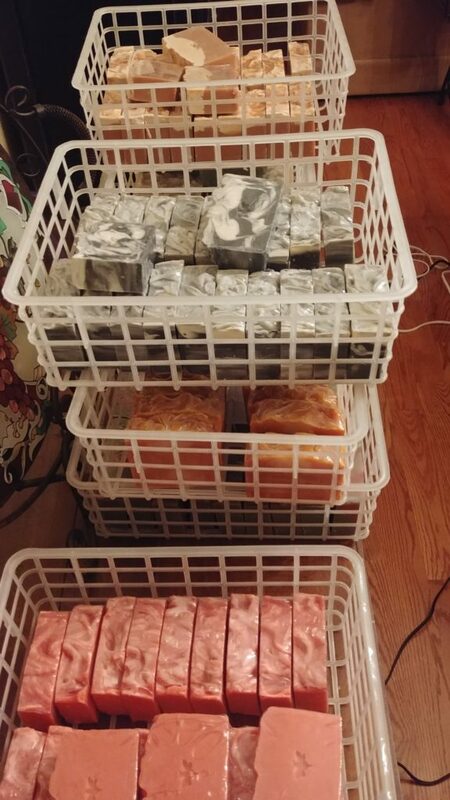 Now the soap is cured, and yesterday I spent several hours stamping and shrink wrapping each bar. 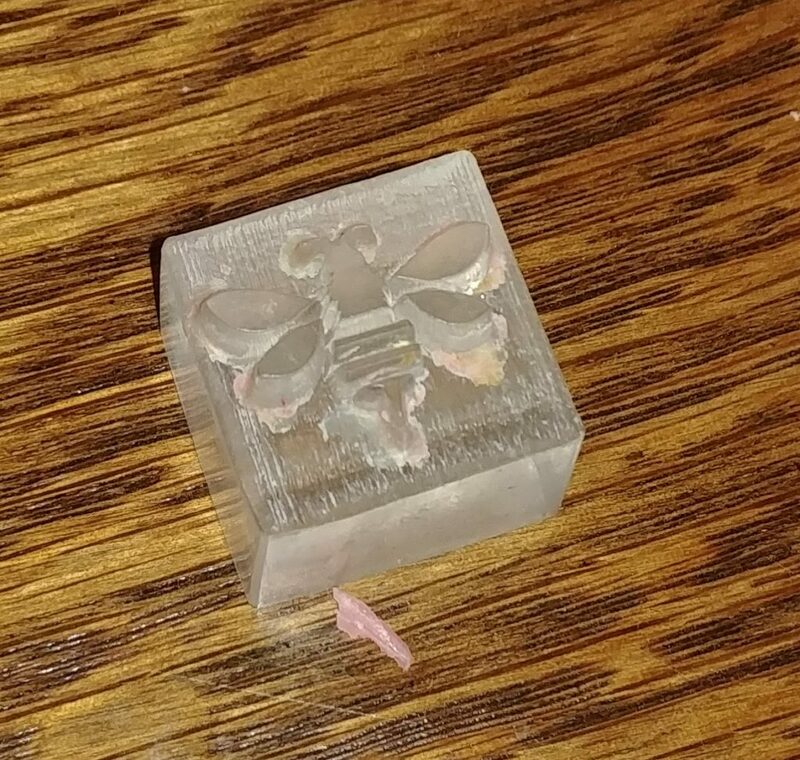 I found this acrylic stamp online, and it leaves a cute little honeybee on each bar of our honey and beeswax soap. It’s an extra step for me, but I think it’s extra special! Here are all the wrapped soaps just waiting for their labels. There are 150 bars altogether, and 7 different varieties. (More about that in my next post!) Can you see the cute little honeybee stamps on the pink bars? I’ll have these soaps all labeled and ready to bring to the Waxhaw Farmers Market on Saturday morning. We’ve restocked our lamb meat and will have that with us too. If you can’t make it to the farmers market, our honey & beeswax soap will be for sale at the Uptown Tea Shop in Waxhaw. Our own farm market will be open on Sunday here at the farm from 1-5, with Farmer Bob’s guided tour to feed the chickens and pet a baby lamb and more at 2:00. Come see us and let us help you with your Christmas shopping with our local raw honey and soap, and consider our tasty lamb for a new Christmas dinner tradition!